The driving force and patriarch of ‘Legends’ is Brian “Goose” Davis whose Youngstown, Ohio roots are on full display from his strong presence to his respectful and affable demeanor. After graduating from UNLV with a degree in political science, his travels led him to the City of Angels, where he tried his hand as a fledgling music manager, a vocation that subsequently had him rethinking his direction. Years and several jobs later, Goose walked into a local barbershop to get a haircut prior to a job interview and the unthinkable happened. By unthinkable it was not the hours plus wait for a barber to service him, but the owners of the shop befriending him and making him an offer he chose not to refuse. They took him under their wing(s) and mentored him, where as he learned how to cut hair and learned the business side of the barber industry. His zealous work ethic and natural talent made the owners investment in his first set of barber tools ($800.00) and the time training him come back ten fold. Within 6 months he was cutting hair full time, all the while being enrolled at American Barber College, where he furthered his business acumen under the tutelage of renowned barber instructor Mr. Gibson (Mr. G). After 18 months his attention to detail and superior customer service, which included mailing out thank you and birthday cards, saw his following double that of other barbers. 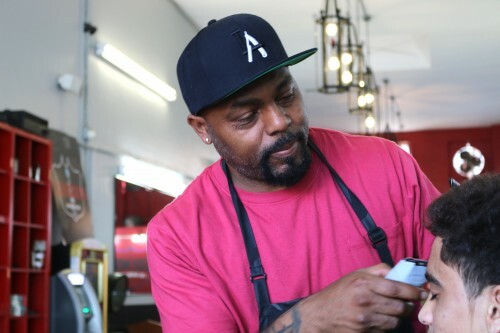 With the blessing and encouragement of his mentors, he set out on his own path and opened Legends the Barbershop in 1999. Legends is place you have to experience for yourself, it is a movement, a place with positive, contagious energy and great service.